Originally built as a sealer and named "Patria"
Screw steamer / 1 funnel, 3 masts / L,B,D 188' x 25' x 13.4' - 36m x 7.6m x 4.1m / 336 tons / Hull: wooden / Compliment: 20 / Engine: 30 nhp / Built K. Jacobsen, Selvig, Norway 1884. Narrative of the first expedition to spent the long Antarctic night below the Antarctic Circle. The "Belgica" was icebound in the Bellingshausen Sea for over a year, becoming a virtual laboratory of human endurance for its 19-member multinational crew. The careers of both of the future discoverers of the Poles--Roald Amundsen (South Pole 1911) and Frederick A. Cook (North Pole 1908) were joined in this expedition. This account by Cook, the ship's surgeon, was first published in 1900. A sealer called the Patria was bought and re-named Belgica for the Belgian Antarctic Expedition led by Commandant Adrien de Gerlache de Gomery of the Belgian Navy. The main aim of the expedition was to find the position of the South Magnetic Pole. The expedition was intended to be summer only, returning before the Antarctic winter began. 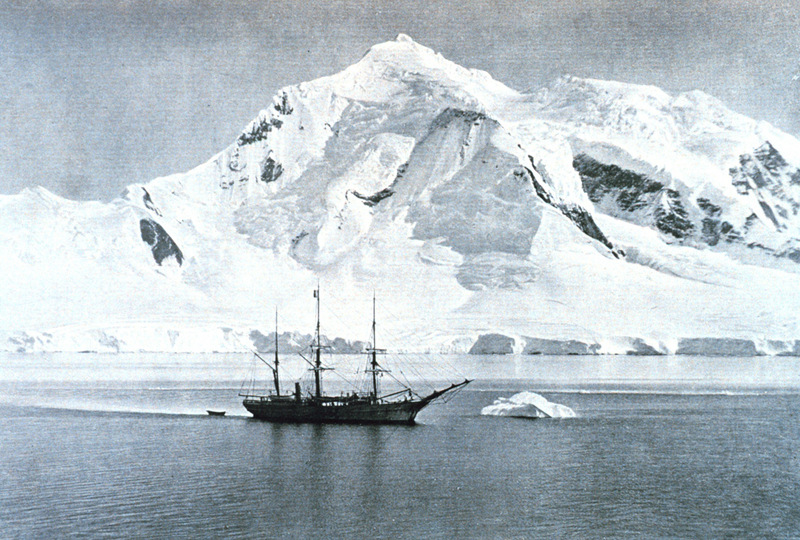 She crossed the Antarctic Circle on the 15th of Feb 1898 off Palmer Land on the Antarctic Peninsula. The men of the Belgica made the first ever land excursions into Antarctica, spending a week ashore in an attempt to travel inland. De Gerlache later ventured further south in an attempt to beat the furthest south record held by James Ross 57 years earlier in 1841 at 78° 11' S, but it was too late in the season to be so southerly and by the 3rd of March 1898 the Belgica was trapped in the sea ice in the Bellingshausen Sea by Alexander Island, 71o 30' S 85o15' W.
Thus albeit involuntarily, the crew were the first ships party to over winter in Antarctica.The unprepared crew had a very difficult time of things, de Gerlache and his captain both succumbed to scurvy with many other of the crew. The Norwegian first mate Roald Amundsen (later to be the leader of the first team to reach the South Pole) and American surgeon Frederick Cook (later to be the first man to reach the North Pole) rallied the crew and enforced a diet of fresh seal meat. After more than a year trapped in the ice, the crew again supervised by Amundsen and Cook, sawed a channel through the ice over a period of weeks to free the ship which could then return to Belgium. 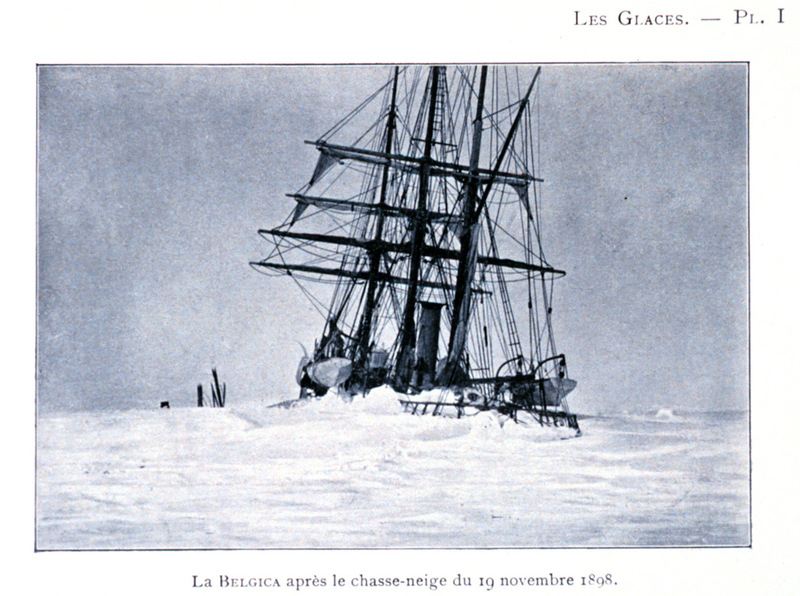 La Belgica in the ice on November 19, 1898.